A number of visitors to this site have asked about power supplies for operating battery valve radios from the mains. 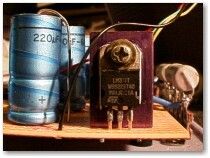 Many later radios use four 7-pin valves and require a 90V HT supply at typically 12mA and a 1.5V LT supply at 125mA or 250mA depending on the valves used. The original batteries are sadly no longer made. One possibility is to make up a 90V battery using ten PP3 batteries in series for the HT, and to use two D-cells in parallel for the LT. This has the advantage that the set remains portable. However, the cost of the batteries is not insignificant - around £10 even when paying trade prices and probably over £25 if buying retail. The most popular solution is to make up some sort of mains power supply, and a suitable design is presented here. It should be possible to make the unit for around £30, and the running costs are negligible. Depending on the components used and the size of the battery compartment in your radio, you may be able to make the unit small enough to fit in place of the batteries. The photographs on this page were kindly supplied by Richard Newman, and show his completed unit. Comments, suggestions and modifications made by Richard and a couple of other constructors are given at the end of the page. If the diagrams on this page are not clear enough, you can download higher resolution copies. See the foot of this page for details. To keep the size and cost to a minimum, a single transformer us used to provide both the HT and LT supplies. Since transformers with the correct voltage secondaries are not now available, I have chosen a standard transformer and designed appropriate circuitry to achieve the voltages required. 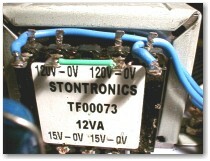 A 12VA transformer having two separate 15V windings is used. This allows the two supplies to be completely separate. This is necessary because the supplies are generally connected via biasing resistors within the radio, so any connection between them within the power supply would affect the operation of the radio. For this reason, a transformer with two separate 15V windings MUST be used - do not attempt to use a single 15V winding for both supplies. The HT voltage is not critical, and most sets are designed to operate from around 100V down to about 60V, to get the maximum life from the battery. For this reason, the HT supply on this power supply is not regulated. D1 to D4 and C1 to C4 form a voltage quadruple circuit. I will not attempt to explain the operation here! With any rectifying and smoothing circuit, the off-load voltage will be 1.414 times the AC RMS input voltage. Therefore, if we quadruple (multiply by four) the 15V AC input, them multiply by 1.414 we get about 85V. In practice the output from the transformer will be a bit higher than 15V so the output will be around 90V. R1, C5 and C6 provide some decoupling to eliminate hum. 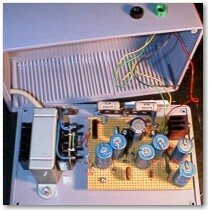 Two capacitors are used in series because 100V capacitors are not so readily available as 63V types. Resistors R2 and R3 ensure the voltage across each of these capacitors is equal. They also discharge the capacitors within a few seconds when the unit is disconnected from the mains. C7 provides additional filtering at higher frequencies. The LT voltage is rather more critical if we are to get the maximum life from the valves. Although the nominal voltage is 1.5V, the valves themselves will operate down to about 1.2V. This is to allow the set to keep working as the battery runs down. When operating from a consistent voltage from a mains supply, the LT should be between 1.3V and 1.4V. This unit is designed to produce 1.35V, regardless of the load current. To achieve this, a voltage regulator is used. The output voltage of the LM317T regulator IC is set by the values of two resistors, R5 and R6. The voltage across R5 will be fixed at 1.25V by the regulator circuitry, so the output voltage of the circuit is a ratio of the two resistor values. If you wish to change the output voltage, the following formula may be used to calculate the resistor values. "Vout" is the output voltage from the circuit. The value of R5 must be no higher than 240R, so it is generally convenient to leave this at 220R and vary R6 to change the voltage. The following table shows the output voltage for various values of R6, assuming that R5 is 220R. Values are given for voltages from 1.3V to 1.5V (for nominal 1.5V valves) and from 1.8V to 2.1V (for nominal 2V valves). Higher voltages can be accommodated by further increasing the value of R6, and may be calculated using the above formula. The input to the regulator is obtained by full-wave rectifying the output from the other secondary winding on the transformer. D5 to D4 are configured as a standard full-wave rectifier - four separate diodes are used because these are cheaper than a packaged bridge rectifier. If R4 were omitted, the voltage across C8 would be about 21V (15V X 1.414). Since the output required is of the order of 1.5V, this means that 19.5V would have to be dropped by the regulator IC. At 250mA, this is about 5-Watts of power dissipation. This is within the capabilities of the IC, given a reasonable heatsink, but to reduce the dissipation, and hence the heat build-up, R4 has been included. This is deliberately positioned between the bridge rectifier and the smoothing capacitor (C8), because in this position it has the added effect of flattening the peaks of the raw rectified voltage. This allows it to drop more voltage while dissipating less power, than if it were positioned between C8 and the rectifier. Depending on the load, the voltage across C8 will be between 10V and 15V. With no load the voltage across C8 will be close to 21V, so a 25V component is required in this position. See notes near the bottom of this page for further comments on the value of R4. C10 and C11 decouple the output of the regulator, while the reference voltage is decoupled by C9. The input to the mains transformer is protected by a 250mA fuse. Note that the outputs are not designed to withstand long-term short-circuits. Momentary short-circuits will not cause any damage. The regulator used for the LT supply has built-in current limiting at 1.2 Amps, which the current on the HT output will be limited to some extent by R1 and the internal resistance of the transformer. Do not allow the HT output to be connected, even momentarily, to the LT output, since this will probably destroy the regulator IC as well as some capacitors. Because my prototype has only been constructed sufficiently to allow the circuit design to be tested, I do not yet have a suitable component layout arrangement available for inclusion on this page. The following information should be regarded as suggestions only. Due to the number of large capacitors etc., I would suggest that tag strip is the most suitable way of assembling the project. Either two rows of tagstrip or a single 2-row tag panel could be used, with the large components being positioned between the two rows. The diagram below shows a suggested layout using two lengths of tag strip. Please note that this layout has NOT been checked or tested. You are strongly advised to compare the layout to the circuit diagram as you assemble the unit. If you find any errors, or come up with a better layout or assembly method, please let me know so I can share it with other visitors. John Shepherd has designed a PCB for this project. The files are available for download from this website - see link at foot of page. Make sure the grounding tags on the tagstrip are not used for component mounting - modify the tags if necessary. If using tag board, remember to space it away from the case so that the rear of the tags do not short-circuit to the case. The unit should be housed in a metal case for safety and to act as a heatsink for U1. Mount U1 with an insulating washer, because its tab is internally connected to pin 2. The case itself should be earthed. The mains lead should pass through a suitable strain relief clip. 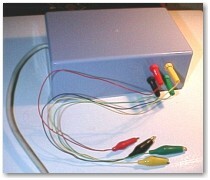 The easiest way of terminating the outputs would be flying leads fitted with small insulated croc-clips. These could be clipped onto the appropriate pins of the battery connectors in the radio, and the insulating sleeves pushed as far over the clip as possible. When the unit is complete, the output voltages should be checked with a meter before connecting to a radio. Also check, with the unit switched off, for any continuity between the HT and LT outputs, and between these outputs and the case. All should be open circuit on the highest resistance range of your test meter. Always switch the unit off and allow a few seconds for the internal capacitors to discharge before touching the output connections. Take great care to ensure all connections are correct. Inadvertently connecting the HT output to the radio's LT connections will probably fuse the heaters of all the valves instantly. If the power supply cannot be housed inside the radio, extra care should be taken to ensure all connections are safely insulated. You may need to make a small hole in the rear of the radio, to allow the mains lead to pass through. Alternatively, you may be able to leave the cover slightly open, providing it is still secure and safe. With the unit switched on, the radio should operate as normal. The power supply case will probably become warm due to the heat from the transformer and U1. The unit must always be switched off at the mains when not in use. The unit would also be useful for testing and repairing radios on the bench, even if you intend to run the repaired set from batteries. My prototype has only been built sufficiently to allow me to test the design on two radios, and previously I asked for anyone who had completed the project to contact me with their experiences. Three constructors, Richard Newman, Richard Booth and Chris ?, did contacted me after building this project. Richard Booth and Chris both confirmed that the layout shown above is correct. Richard Newman was concerned that U1 was running very hot. After some discussion he has increased the value of R4 to 68R 5W, which results in a much cooler regulator. Clearly this value may require some adjustment, depending on the types of set you are using. We decided that the aim is to get around 6V at the input to the regulator (pin 3) with the unit on load - less than stated above. Many thanks to the two Richards and to Chris for their help and enthusiasm, and thanks also to Richard Newman for the photos. I found the cheapest place to get the transformer is Farnell, and now that you can order online with a Visa card and that there is no delivery charge, it's a better deal than Maplin. I might add a further stage to it later so that it can supply the grid bias voltage, but for the moment I'm using a 4.5V cycle battery. With the amount of current drawn I guess this will last a while. In the end I used stripboard and a plastic box. I don't like small earthed metal boxes on the bench (I built it as a general supply not just for one set) in case they come into contact with something live!! I have two rows of sockets fitted to the bench to supply isolated and non-isolated mains.... so accidents could happen. It's an opinion and there are arguments for and against. Remember I changed the value of the resistor in series with the LM317 to 68 ohms to reduce dissipation of the device? Well as expected the resistor then got quite hot so I used a dodge that I picked up years ago. I used two 30 ohm 5 watt resistors in series so it spreads the heat out and of course each resistor dissipates less than the single 68 ohm. The result is that the PSU does not need any ventilation at all and runs only very slightly warm after many hours of use. Great stuff!! I have some pictures of the PSU I built. There are five pictures shown that show the general layout that I used. The finished item is rather plain at the moment and I still have to fit an on/off switch and some sort of power indicator (or possibly an illuminated switch). As yet there is no mains fuse but I intend to fit a panel mounted type so that it can be changed without removing the cover. I've shown a close-up of the transformer that I used showing the two 120v primaries connected in series. The transformer is available from CPC under TF00073. Also shown are the two 30 ohm resistors that I used in series with the LT regulator and a close-up of the regulator mounted on a finned heatsink salvaged from an old VCR. There is a general shot of the innards and also of the completed boxed item. The coloured leads Red, Black, Green and Yellow correspond with the colours used for HT and LT on my one and only battery valve set. John Shepherd has designed a PCB for this project. The files are available for download from this website - see link below. James Lee has provided a photograph showing the PCB component layout, which is also included in the download. David Smith pointed out that the internal reference voltage in the LM317T is 1.25V, not 1.2V as I had previously stated. I have now corrected this article and the calculations, and changed the value of R6 to 18R to suit. High resolution copies of the circuit and layout diagrams (in .GIF, CorelDraw 7 and ISIS Lite formats) are available for download in a ZIP file. File size is 118K. To download a copy Click Here. The artwork files for a PCB for this project, designed by John Shepherd (in .GIF and ARES Lite formats), together with a PCB layout photograph from James Lee are available for download in a ZIP file. File size is 75K. To download a copy Click Here. The data sheet for the LM317T, published by ST Microelectronics, is available for download as an Adobe Acrobat PDF file packed in a ZIP file. File size is 71K. To download a copy Click Here.